Color Sensation is a rich hair color cream with multi-dimensional pigments for sensational color and silky shine and 100% gray coverage. The no mess, non-drip cream formula is easy to apply. Plus, in every hair coloring kit, you'll find an easy-to-use precision application brush, perfect for those hard to reach areas or to ensure clean application around your hairline. Rated 5 out of 5 by KMamma from Love how it turned out and my hair is so silky! I love how my hair turned out! Due to medication, my once natural hair color of reddish blonde turned to a muddy brown. Because my hair is long I used two boxes concentrating on the heaviest application at the top of my head. I gradually put less color on as I worked down to the ends of my hair, It turned out fabulous! It is bright at the top and then fades to a peachy, rosy pink at the ends of my hair. The color faded very little so I waited a month and then colored my hair again. It came out even better the second time! I have to admit, I was very skeptical when I first bought this product. I had tried a similar color product by another company and was bitterly disappointed as not only did the color come out very faint, but it washed completely out after four shampoos. I kept track of how many times I shampoo'd after using the Color Sensation. I got up to 32 times and really did not need to re-do it but I decided I wanted to as my natural color was showing a bit at the roots. Rated 5 out of 5 by keilyb from I LOVED this color. I had been looking for orangy-pinky colors and this was the perfect shade. This was also a great price. The instructions were easy to read and the product way to use. Rated 3 out of 5 by maryodaf3 from I think this product would have worked better, had I been able to lighten my hair to the appropriate level. I didn't want to risk over bleaching, so I didn't lighten it enough. The color still deposited well for the level that I was able to lighten it, but it wasn't even or as bright as I'd like. If you are naturally a light blonde, this will work great for your hair. It's a beautiful color, but I didn't want to bleach too much and risk damaging my hair. 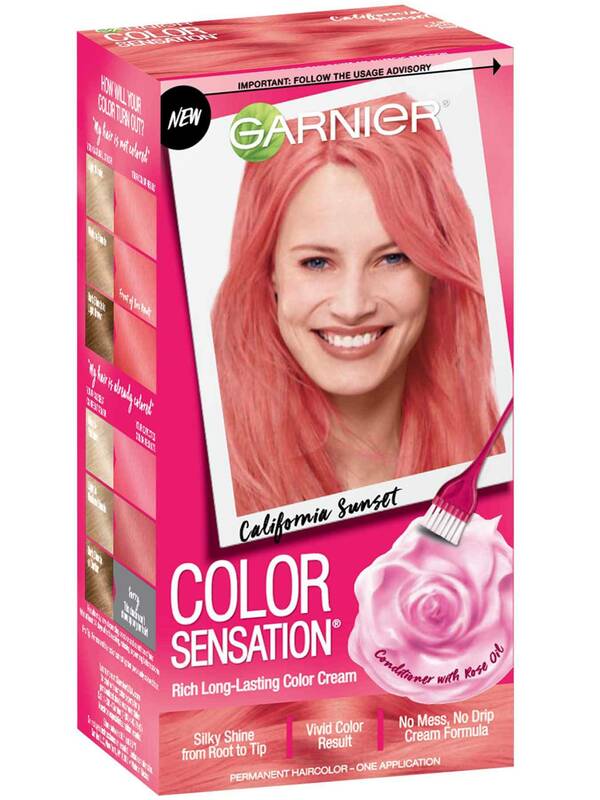 Rated 5 out of 5 by brandymad19 from I love garnier color sensation I got the California sunset. It was really easy to use no mess I have ultra light ash blonde hair and it turned out alot parker thank I thought it would. And it is totally fine I LOVE IT !!! And I have gotten alot of compliments I done the underneath of my hair for a little peekaboo boo of color. It turn out so pretty !! Rated 3 out of 5 by erincd65b from Beautiful color! It wasn't too dramatic, but still bold enough to be a noticeable and different change. It does fade to a weirdish color, as most products like this do. I probably wouldn't buy it again, I might go with the L'Oréal temporary colorista L'Oréal Paris Colorista Semi-Permanent Hair Color because even though it is temporary, you can just keep adding more as you like and it's not PERMANENT. Rated 4 out of 5 by rachelc18 from I recieved this free from influenster to try, but all of the review is mine. This color is super vibrant and it comes with a root brush which makes any style you want to do work! The only issue I had was when I washed my hair it started to fade out. I bought purple shampoo and now it's starting to stay in a little better but I was hoping the vibrancy would stay! Rated 3 out of 5 by paulayamashita from Overall it’s okay. The color “California Sunset” is beautiful! I loved it at first, and I received a lot of compliments of my beautiful hair! Thumbs up: it’s easy to apply, no mess at all! It has a great fragrance! The color is beautiful! It didn’t stained my sink and towels! Problems: I had colored hair, and I needed to remove the previous color, so the color would work in my hair. Usually, I don’t have problems with that and my hair always respond very well to bleach and coloration. It always looks pretty and shine! But, at this time, I felt my hair more damage and not soft and shine on the following days. Second problem, I’m not sure if the color will last longer, because after 2 washes my hair already has washed-out color. 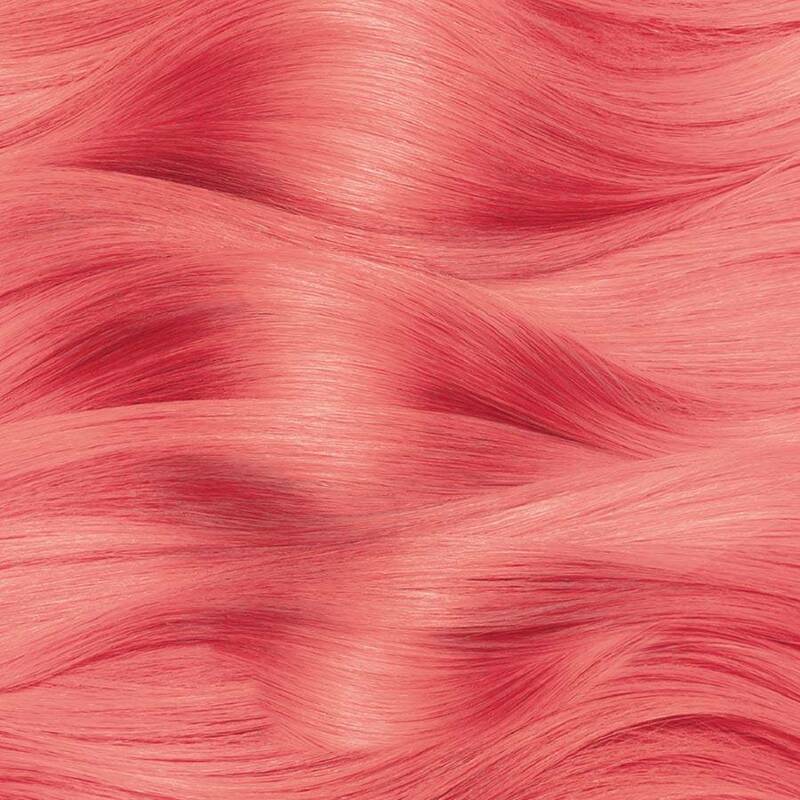 The tips have this pinkish faded color and the roots lost the vivid color. So, overall I can say it’s good! It’s a good deal for someone who has very light blond hair. But, if you already have colored hair, it might not give you a great result. Unfortunately, I’m not willing to use it again, which is sad because I really love the color.